The vigil guards comprise four uniformed officers each standing at a corner of the casket with his head bowed, back turned away and ceremonial sword inverted – led by a senior officer who stands at the head of the casket facing inwards. 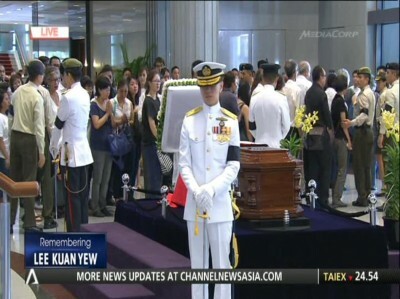 SINGAPORE: The Republic’s founding Prime Minister Lee Kuan Yew has been accorded the nation’s highest form of respect: The traditional mounting of the vigil guards during the lying in state period at the Parliament House. Mr Lee’s coffin was on Wednesday (Mar 25) transported to the Parliament House, and it will lie in state until the State Funeral on Sunday. The vigil guards are in place, and comprise four uniformed officers each standing at a corner of the casket with his head bowed, back turned away and ceremonial sword inverted. They are led by a senior officer who stands at the head of the casket facing inwards.